Being "judgmental" is a stance most people recognize as transgressing beyond widely accepted social norms. But what's the harm in judging others? And why do so many people do it so often? 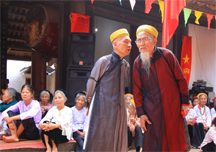 Two men whispering at a village festival. Workplace judgment messages are sometimes propagated in whispering sessions. More often propagation occurs in more private settings where whispering is unnecessary. Like many words in many languages, the word judging in English has multiple meanings. One meaning denotes a potentially problematic pattern of thought that can lead to behaviors that cause real problems at work. To judge others in this sense is to evaluate their worth as people, based on possibly flimsy evidence not subject to review, and then to find those people wanting. This pattern causes trouble because, often, the judgments we make aren't merely inaccurate. They also have a self-fulfilling property that limits the ability of anyone to effectively dispute — or even to question — the validity of the judgment. That is, the act of forming the judgment, and propagating it, prevents anyone from correcting errors in the judgment itself. Judging isn't always dysfunctional. For example, consider an organizational leader who repeatedly engages in behavior abusive of subordinates, or in corrupt self-dealing, or in misrepresentation of facts for personal advantage. Judging such a person as unfit for any level of organizational responsibility is not only functional, but might also be ethically obligatory. So judging itself isn't problematic. What is problematic is judging based on insufficient or manufactured evidence, with inadequate mechanisms available for error correction. Even such judgments — call them proto-judgments — can occasionally prove to be accurate. The subset of proto-judgments of interest here are those that would prove to be inaccurate and harmful if subjected to careful review. In what follows, I use the term propagator to refer to a person who passes the judgment along to others. The form in which the judgment propagates is the message, which could be conveyed in conversation (face-to-face or telephone), or text message or email or (shudder) hardcopy. The person who receives the message is the recipient. The target is the person who's being judged. The originator is the person who originates the judgment. Any given judgment can have any number of originators and propagators. Let's have a look at how this fascinatingly dysfunctional thought pattern works. Sharing is the means by which propagators pass their judgments to others. Propagation provides a means of amplifying the effects of the judgments to enable them to influence more people than merely the originator of the judgment. them along anyway.of judgment messages are rarely able to evaluate their validity. Recipients usually rely on the propagator's credibility as a means of assessing message validity. Doing so can be risky. As a recipient of a judgment message, if you can't independently validate the judgment contained in the message, beware. Covert judgments are much less likely to be disputed or reviewed against disconfirming evidence, because only the propagator(s) and recipient(s) know that the message has been passed along. Secrecy enables the judgments to persist even if inapplicable, and protects them from any form of corrective action. Moreover, secrecy acts as an accelerant, because originators of unsubstantiated or easily falsified judgments are more likely to propagate them if they feel confident that (a) the judgment won't be subject to review and (b) neither originators nor propagators will be required to provide justifying evidence. In this way, secrecy encourages spontaneous judgment origination and speeds propagation. Receiving in secret — we usually call it "in confidence" — a message of judgment about someone else is an indicator that the message is very unlikely to have been validated. Another element of the "secrecy envelope" that's so necessary for rapid and accelerating message propagation is anonymity of the sources of supposed facts in evidence that support the judgments. By characterizing the anonymous source as someone credible and authoritative, originators and propagators can harvest much of the good will a named source would provide for the judgment, without exposing the source to the risk of consequences of having provided the evidence itself. Anonymity of sources also enables manufacture of evidence. If the message cites anonymous sources, beware. Such citations are indicators of untrustworthiness. Messages that convey judgments that do harm to the target are more likely to propagate rapidly and widely, because some propagators have an interest in harming the target. Motivations can range from schadenfreude to competition for promotion, to vengeance for perceived wrongs. If you receive a judgment message from someone who would benefit from harming the target, be skeptical of its authenticity. Some judgments are actually little more than encapsulations of stereotypes that match characteristics of the target. For example, if the target belongs to a demographic group, the judgment might correspond to the stereotype of that demographic group. In this way, judgments gain propagation speed and longevity by exploiting a cognitive bias known as confirmation bias. Messages that align with the propagators' preconceptions about the stereotype are more likely to propagate. Judgments that correspond to stereotypical characteristics of the target can usually be disregarded as wholly without merit. When you detect such messages, pause and reflect on their possible effect on your own conclusions. Propagating such judgments can be ethically questionable. Confirmation bias can play an accelerant role when the judgment involves not stereotypes based on demographics of the target, but instead involves other information or misinformation about the target. For example, if the target happens to be absent from work at the same time as another person with whom the target is wrongly rumored to be having an affair, the simultaneous absences can serve as "evidence" supporting judgments about the target's loose morals. Judgments based on inferences drawn from coincidences are particularly suspect. Would you like to see your comments posted here? rbrenZpviGqrzNUkrbOHbner@ChacdeOjOjPFBWWDktcQoCanyon.comSend me your comments by email, or by Web form. Practitioners of workplace politics intent on gaining unfair advantage sometimes use misinformation, disinformation, and other information-related tactics. Here's a short catalog of techniques to watch for. Most projects have both supporters and detractors. When a project has been approved and execution begins, some detractors don't give up. Here's Part II of a catalog of tactics detractors use to sow chaos. When, in the presence of others, someone asks you "a simple yes or no" question, beware. Chances are that you're confronting a trap. Here's Part II of a set of suggestions for dealing with the yes-or-no trap. Decision-makers who rely on incomplete or biased information are more likely to make faulty decisions. Congruent decision-making can limit the incidence of bad decisions. See also Workplace Politics and Workplace Bullying for more related articles. I offer email and telephone coaching at both corporate and individual rates. Contact Rick for details at rbreneaHdYCiJppCCyWHLner@ChacWQLIXGkxBVsUUNNzoCanyon.com or (650) 787-6475, or toll-free in the continental US at (866) 378-5470.